Ohio Republicans are recruiting former Ohio State University head football coach Jim Tressel to run for the Senate this year, seeing his popularity across the Buckeye State as a key asset to challenge incumbent Democratic Sen. Sherrod Brown. Tressel, president of Youngstown State University, has not expressed interest in launching a Senate bid, but top Ohio Republicans are hoping that he reconsiders, the Washington Examiner reported Wednesday. Tressel coached the Ohio State Buckeyes football team from 2001 to 2010, where he won the 2002 national championship and became a celebrity across the state before resigning in the wake of NCAA infractions. He also coached Youngstown State to four Division I-AA national titles before that. "Jim Tressel is welcome pretty much wherever he goes in Ohio," Rep. Dave Joyce (R., Ohio) told the Examiner. "Obviously, he's had the opportunity now to run some universities, so he's certainly got football team management and now university management under his belt. He's obviously a great campaigner because you've got to work hard to recruit young talent against everybody else," Joyce said. "Tressel's certainly an interesting idea." Joyce is not the only one who has expressed interest in Tressel challenging Brown, in large part because of the famed coach's name recognition. "I wish he was [interested]," one prominent Ohio Republican said, noting his statewide name identification as a chief reason. 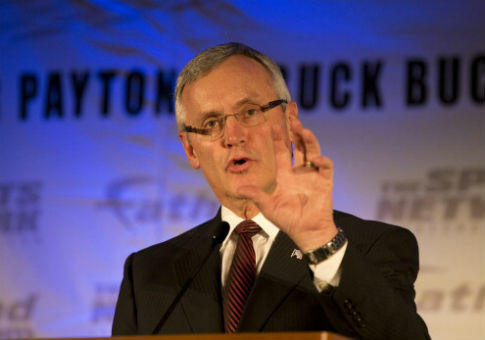 Tressel has donated to Republican campaigns over the past decade, mostly to Ohioans. In 2010, he donated $250 to Rep. Steve Stivers (R., Ohio), who chairs the National Republican Congressional Committee. In 2016, he gave the maximum donation of $2,700 to Ohio Gov. John Kasich's presidential campaign. The former football coach's only donation outside of Ohio, besides his support for Kasich, was $1,000 to the Republican National Committee in 2008, when Sen. John McCain (R., Ariz.) was the GOP presidential nominee. Ohio Republicans are looking at new candidates to challenge Brown after GOP frontrunner Josh Mandel, the state treasurer, dropped out of the race last week, citing his wife's health problems. Republican leaders in Ohio have also reached out to J.D. Vance, a venture capitalist and author of Hillbilly Elegy, about running for the Senate. UPDATED 3:03 P.M.: This article initially did not explain that four of Tressel's national titles were at Youngstown State. This has been corrected. This entry was posted in Politics and tagged 2018 Election, Football, Ohio, Senate. Bookmark the permalink.